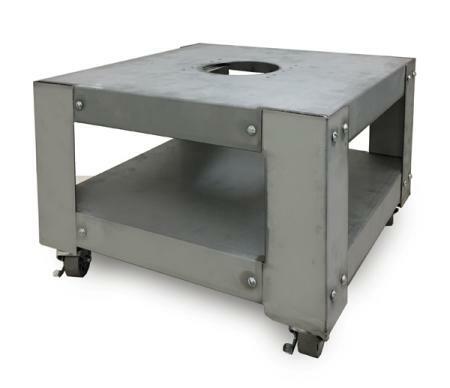 INCLUDES DELUXE ROLLING KILN STAND! The TnF-27-3 features sectional construction. Separate the kiln bottom and two sections to repair bricks, change elements, or to move the kiln down narrow stairwells or through the narrowest doorways. Twist-lock spring latches hold the assembled collars securely.The top row of brick in the TnF-27-3 is 2” high and without element grooves. It is less susceptible to damage during loading than a grooved brick. The TnF 27-3 now comes with a deluxe rolling stand at no extra charge! The new 12" stand has locking casters, a mounting bracket for the Orton Kiln Vent, and a greenware drying rack. 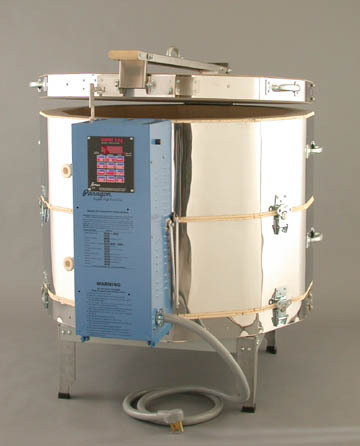 You will enjoy the convenience of effortlessly moving the kiln out of the way when not in use.